One of the largest volcanic eruptions in the past 10,000 years occurred in approximately 1620 BC on the volcanic island of Santorini in the Aegean Sea. 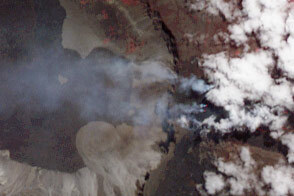 This astronaut photograph illustrates the center of Santorini Volcano, located approximately 118 kilometers to the north of Crete (not shown). Prior to 1620 BC, the island of Santorini, now known as Thera, was built up by layers of lava created by overlapping shield volcanoes, and it had experienced three significant eruptions that formed overlapping calderas, or collapsed magma chambers. Around 1620 BC, the fourth (and latest) major eruption created the present-day islands and caldera bay of Santorini Volcano. 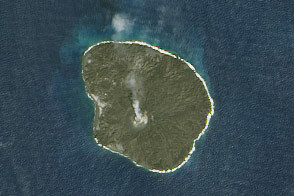 The caldera rim is clearly visible in this image as a steep cliff forming the western shoreline of the island of Thera. Following the 1620 BC eruption, much of the previous island of Santorini was destroyed or submerged; this event may have been the inspiration for the legend of the “lost continent” of Atlantis. Far from legend however, many archeologists believe that the eruption was a major factor—or the immediate cause—of the destruction of the classical Minoan civilization of Crete. The white rooftops of cities and towns trace the caldera rim on the island of Thera, and overlook the young central islands of Nea Kameni and Palaea Kameni, which both formed from lava domes and flows that started erupting approximately 1,400 years after the cataclysmic 1620 BC event. Several of these flows are visible in the image as brown to dark-brown irregular masses forming Nea Kameni (image left). The most recent volcanic activity in the Kameni islands occurred in 1950, and included some small explosions and production of lava. 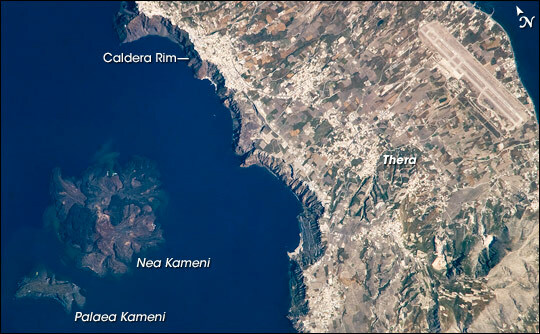 The extent of development, and location of an airport (image upper right) on Thera illustrate the popularity of Santorini Volcano as a tourist destination. Today, volcanic activity is closely monitored by the Institute for the Study and Monitoring of the Santorini Volcano, or ISMOSAV. Astronaut photograph ISS017-E-5037 was acquired April 19, 2008 with a Kodak 760C digital camera using an 800 mm lens, and is provided by the ISS Crew Earth Observations experiment. The image was taken by the Expedition 17 crew, and is provided by the Image Science & Analysis Laboratory, Johnson Space Center. The image in this article has been cropped and enhanced to improve contrast. Lens artifacts have been removed. The International Space Station Program supports the laboratory to help astronauts take pictures of Earth that will be of the greatest value to scientists and the public, and to make those images freely available on the Internet. Additional images taken by astronauts and cosmonauts can be viewed at the NASA/JSC Gateway to Astronaut Photography of Earth. Caption by William L. Stefanov, NASA-JSC. One of the largest volcanic eruptions in the past 10,000 years occurred in approximately 1620 BC on the volcanic island of Santorini in the Aegean Sea. This astronaut photograph illustrates the center of Santorini Volcano, located approximately 118 kilometers to the north of Crete.